A lot of us would love to come across an Arabian kettle which would produce a genie when we rub it. For the three wishes that would come out, as a result, some of us might ask for eternal life, some might ask for money, some happiness and the really smart ones would ask for unlimited wishes. Well, now that you know what to ask for, you can make the best use of your wishes in Genie Jackpots by Ash Gaming. Ash Gaming is a developer of online slots based in the UK. Ash Gaming has been around since the year 2000 and they have been wowing players all over the world with the quality of their slot games. The company is able to get to this height by incorporating numerous fun features in its games and by making use of unique themes. In 2011, Ash Gaming was acquired by Playtech. Despite the takeover, Ash gaming still runs the online slot game development section at Playtech, showing the amount of trust Playtech has in Ash gaming’s creativity and innovation. No doubt, Genie Jackpots slots would be a confirmation of the general trust that players have in the ability of Ash Gaming. Genie Jackpots slots is five reels, three rows, and twenty paylines game. The reels are housed in an ornate structure which floats in the skies. Some people could be right in guessing that this ornate structure resembles a magic carpet. The high-value symbols in Genie Jackpots slots are the game logo, the Genie’s turban, and the magic lamp. These high-value symbols can make an appearance anywhere on the five reels. The other low-value symbols are the classic slot icons: J, Q, K, A, and 10. The wild in this slots game is the performing monkey and there is also a bonus icon which can be utilised in activating the numerous features. Genie wilds and re-spins that turn positions into wilds and grants one re-spin. Genie wilds and All Pays Doubled that turn positions into wilds and grants a two times multiplier. Infectious Monkey Wilds that add monkey wilds to the reels. 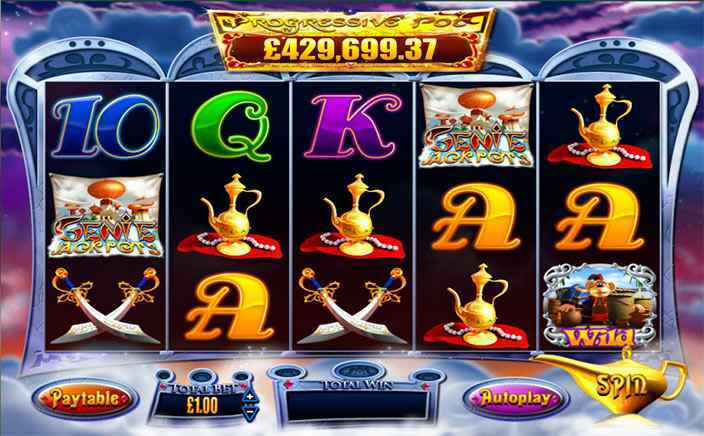 Progressive Jackpot Award that awards players with large sums. Bonus Feature Award that could either be magic Carpet or Mystery Win Bonus. In the Magic Carpet feature, players would have to pick magic carpets in order to move the monkey; winning bets in the process. In the Mystery Win Bonus, players can get about a hundred times their total bet. 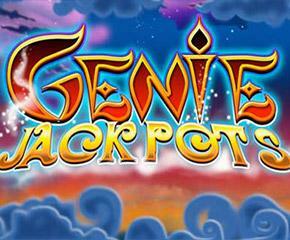 Genie Jackpots slots is a very nice game and possess awesome features and funky background music. Play this slots game to get nice rewards and to ease your nerves.